Fanatical is running a SEGA sale this week. Excellent discounts on Bayonetta, Endless Space 2, Shining Resonance Refrain, Vanquish, and more. Valkyria Chronicles $4.55, Alien: Isolation $9.49, and more SEGA titles on sale at Bundle Stars. Sale ends tomorrow at 6PM Pacific. Historic lows on Battle Chasers: Nightwar, Darksiders III, Shenmue I & II, and more in Fanatical's new Spring Sale. More waves of offers to come daily so check back later in the week for additional discounts. Now through Friday the Bundle Stars Spring Sale is in the Encore phase. Not all the deals it once promoted are back on sale, but some are like Tabletop Simulator, Stellaris, Skullgirls, the Batman: Arkham Knight bundle and more. New lows on Pillars Of Eternity Definitive Edition plus solid discounts on Cities Skylines, Stellaris, Tyranny, and more in their Paradox title sale. Discounts good now through Monday morning. Halloween sale pricing on Paradox Interactive discounts at Bundle Stars this week. Cities Skylines for $7.49, Pillars of Eternity $17.99, Stellaris $26.79, Tyranny $22.49 and more. Few new lows, but all in the 50-75% discounts. Today the Fanatical Lunar New Year Sale went live. 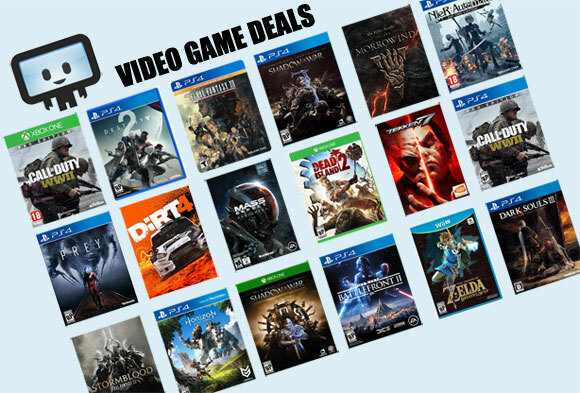 Thousands of PC gaming titles on sale now through February 11th up to 80% off instantly plus an 8% off stacking coupon code. New lows on Darksiders III, Middle-earth: Shadow of War, Jackbox Party Pack 5 and more. Cheap Dead Rising, Devil May Cry, and Street Fighter series in Fanatical's Capcom sale. Discounts up to 80% off. New low on Dead Rising 4 Frank's Big Package. Through next Monday, Fanatical is discounting IdeaFactory JRPG titles up to 90%. New low prices on Dark Rose Valkyrie, Fairy Fencer F, Monster Monpiece and Trillion God of Destruction. All Steam keys. This week Fanatical is launching a Warner Bros. Sale with solid discounts on Hitman 2, LEGO, Batman and Mortal Kombat titles. New low price games includes Injustice 2, LEGO DC Super Villains, LEGO Incredibles and Shadow of War. New lows on Bayonetta, Hitman 2, Vanquish, Valkyria Chronicles 4, Darksiders II Deathinitive Edition and more in Fanatical 2018 Winter Sale. Massive sale with discounts up to 85% off plus a stacking 10% off coupon code for additional savings. Fanatical's Winter Sale is now in "encore" phase as we near January 4 (which is non-coincidentally when a lot of other competing sales end as well). While most titles are cheaper at GMG or simply matching Steam Store pricing, a handful of goodies are cheaper than everywhere else such as Spintires and Superhot VR. Fanatical Winter Sale continues onto Day 10 with new historic low on Yooka-Laylee, Northgard, Sheltered and select The Escapist titles. In terms of top selling (and lowest priced games) in the sale thus far: don't miss lowest ever XCOM 2, War of the Chosen, Tekken 7 and Tales of Berseria. All Steam keys. Bundle Stars Winter Sale is now in encore phase with almost a full thousand of games back on sale. Top pick includes Doom, The Secret World Ultimate Edition, Jackbox Party Pack 3, and Warhammer: End Times Vermintide. Ends in 3 days. New lows on Goat Simulator, TransOcean 2: Rivals, Craft the World, Door Kickers, and more in Day 2 of Bundle Stars Winter Sale. Dirt cheap Sniper Elite series as well as the X-series space titles.